Ashampoo Burning Studio has been one of the most popular free CD, DVD and Blu-ray disc burning or writing software that serves as the alternative for pricey Nero. Ashampoo Burning Studio is comprehensive burning suite that designed to quickly burn data, rips audio CDs, copies discs, creates and burns disc images (ISO, CUE/BIN and ASHDIS formats), erase rewritable discs, and create or print disc covers. The new Burning Studio 2012 has added lots of features such as Autoplay Editor module to build auto-starting data discs, Audio Player that can direct play audio files and audio CDs from program, and so forth. Burn CD, DVD or Blu-ray discs and update previously burned discs by adding and removing files and folders. Back up valuable data to single or multiple discs. Burn Blu-ray discs in HD or full HD format. Create slideshow DVDs with photos and video clips. Create high-quality DVD slideshows with titles, transitions and background music. Erase rewriteable discs – quick and easy erase functions for reusing rewriteable discs. Expert burn functions for full control. With full-featured cover and label designer prints to labels or directly to printable discs. 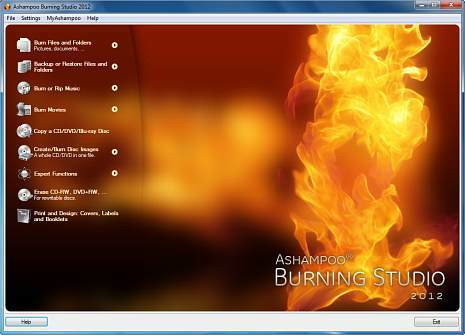 Ashampoo Burning Studio 2012 normally costs $49.95 to purchase. As part of promotional offer, Computerbild.de is giving away free full version of Ashampoo Burning Studio 2012. The web browser should prompt you to download and save ashampoo_burning_studio_2012_cbe_11.0.4_sd.exe setup installer. Install the Ashampoo Burning Studio 2012 by running the ashampoo_burning_studio_2012_cbe_11.0.4_sd.exe setup installer. Note: The installer tries to install MyAshampoo Toolbar, and set MyAshampoo Search as default home page and default search, unselect if not needed. Install and active Ashampoo Burning Studio 2012.